In the early 18th century, as the British East India Company began engaging in regular trade with the Indian subcontinent and China, soldiers returned from the colonies with cashmere shawls. Originally the weavings were worn by men in Kashmir, but once imported to England and Scotland the shawls immediately became a fashion statement for wealthy ladies. As Josephine Bonaparte began to sport “les cachemires,” the trend expanded through France and across the ocean to America. The shawls, however, were astronomically expensive. A biographer of Sir Walter Scott records the bridal trousseau presented to Scott’s French bride in 1797, including a Kashmir shawl that cost 50 guineas (about $100), a huge sum at the time. The high costs of imported shawls encouraged European textile manufacturers to imitate Kashmiri designs, sacrificing quality for low costs. The Bruce Museum in Greenwich, Connecticut, recently unwrapped a new exhibition that highlights its collection of beautifully woven cashmere shawls. Kashmir Shawls from the Bruce Museum Collection features a display of ten outstanding shawls selected from the Museum’s international textile collection. Most date from the early to mid-19th century and several were given to the Bruce Museum by Greenwich families that passed them down from one generation to the next. 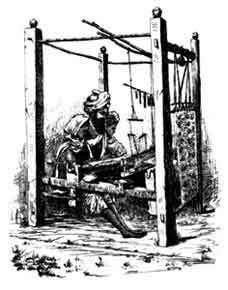 Some of the shawls were produced in Kashmir, India, and the others came from European manufacturers. The word “cashmere” derives from an 18th century English spelling of Kashmir, which is the politically tumultuous, northwestern region of the Indian subcontinent. Predominantly Muslim, Kashmir is also home to a significant Hindu population. The region is known for its production of finely woven and pieced shawls, an art that was practiced as early as the 6th century BCE. However, it is commonly held that shawls of the type shown here were woven beginning in the 16th century. Cashmere shawls are derived from the soft undercoat of the double-fleeced cashmere goat (Capra hircus laniger), which naturally sheds its winter coat every spring. The fiber is also known as pashm (Persian for wool) or pashmina (a Persian/Hindi word derived from pashm). Once the wool of the goat has been collected, the coarse protective fibers are separated from the soft underlying hairs. The resulting material is then ready to be dyed and converted into fabric. As the demand for cashmere has increased and innovations in textile manufacture have developed, cashmere farmers have resorted to using a coarse comb which pulls tufts of hair from the goat’s coat rather than just relying on the collection of the sheds. Today, most cashmere goats are combed or shorn of their fleece, and then the wool fiber is de-haired, or separated using a mechanical process that separates the coarse hairs from the fine hair. 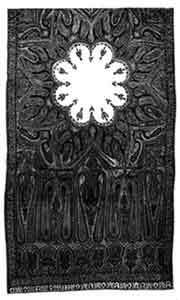 Most Kashmiri shawls were adorned with botehs, or buta. Boteh, literally meaning “flower,” refers to the motif of a tightly-packed pyramid of flowers above a vase. A kidney-shaped teardrop, the boteh is believed by scholars to be a fusion of a stylized pine, fern, or cypress tree. While the motif originated as plant-inspired, in Europe the design was thought to be a protective charm to ward off demons. In the early 19th century, when weavers of the town of Paisley, Scotland, began manufacturing shawls en masse, the boteh became known as “paisley.” Scotland took weaving from a cottage industry to an industrialized process with the advent of the jacquard loom, a mechanical loom invented by Joseph Marie Jacquard in 1804 that simplifies the process of manufacturing textiles with complex patterns. The fashion for paisley shawls first peaked in Europe around 1800, and by the mid-19th century it had spread throughout America. Kashmir Shawls from the Bruce Museum Collection is on view through February 28, 2011, in the Bruce Museum’s Bantle Lecture Gallery. The Bruce Museum is located at 1 Museum Drive in Greenwich, Connecticut, USA. Please call ahead or check brucemuseum.org for viewing hours. The exhibition is supported by the Charles M. and Deborah G. Royce Exhibition Fund.